When it comes to physical attraction, smell is everything, some experts say. It’s no secret that when something smells good, it provokes a positive reaction – a freshly bathed infant, the salty mist from the ocean, a bouquet of fine roses, and, of course, our favorite perfumes. These scents can evoke deep personal and emotional reactions. Certain familiar scents can take you immediately to a fondly remembered time or event in the past or remind you of a favorite person. How many of you smell the scent of lavender or rose geranium and remember your grandmother’s warm, loving presence? Tiring of the overpowering and pervasive odor (and having allergic reactions) of synthetic fragrance, many have turned to natural ingredients for perfumes, skincare and relaxation products. The emerging study of aromatherapy and natural perfumery is exploding across the United States and the use of natural essential oils for stress relief and simple health problems is now commonplace, both at home and in the clinic or hospital. The Home Spa is now seen as not only desirable, but necessary. The revival of the interest in personal hands-on preparation of perfumes and natural scented products has created an emergence of plant extraction and distillation training for the aficionado and professional, alike. People are seeking ways to re-connect with the plants and flowers of the Earth to make their lives more meaningful and to seek answers to the deeper questions of purpose. You can find a wide range of ingredients and natural fragrance materials to make thoughtful perfumes or naturally-fragranced bath and skincare products with a click of your mouse at www.wingedseed.com. You might try your hand at simple natural scented products for gifts that are sure to please this season. And,you’ll save money during these difficult times. Some of your creations may offer additional health benefits to surprise and delight the recipient. Here are some simple ideas to try. 20-35 drops of a combination of essential oils. Rose otto (or Geranium), Lavender, Lemon and Sandalwood (or Vetiver) makes a nice floral scent. (Easy on the lemon and remember to stay out of the sun for a day after bathing to avoid sun sensitization). 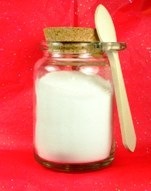 Place Sea salt in glass jar and add, drop by drop, the essential oils. Tightly cover and let sit for several days, shaking periodically. Decant salts into plastic jar or container suitable for use in the bath. Present in a lovely organza gift bag with instructions to use within 2-3 weeks to maintain strength. For layering of scent, make the following simple cologne. Measure the distilled water into a thoroughly cleaned glass jar. Add the vodka slowly to prevent cloudiness. Gently mix in the rose petals until they are completely wet. Add the rose oil and mix well. Let the mixture stand in a covered bottle in a cool, dark place for one week to allow the scent to age. Strain mixture and pour into decorative perfume bottles or perfume misters. You’ll find perfume bottles and misters in the packaging section on the website. Place a few Colossal Salt Crystals from Brazil (item 66004 found in Dry Raw Materials) in a pretty dish. A nice covered dish works beautifully. Slowly drop a favorite essential oil or undiluted essential oil blend directly onto the crystals to the desired saturation. If in an open dish, cover tightly with saran wrap. Wrap with a pretty bow and it’s ready to go. This potpourri is lovely anywhere in the house. If placing in the bathroom, make sure it cannot be easily knocked over and broken, especially near the tub. The salt crystals can be refreshed over and over with the essential oils and add negative ionization to the scent. If you simply don’t have time to make your own, may we recommend a couple of the lovely aromatic gifts from Samara Botane to delight the people in your life. Renew Milk & Honey Bath Ensemble This fabulous skin softening blend dissolves in the bath to create a beautiful skin renewing therapy – drops of the essential oil blend make it aromatically restful while adding additional skin healing, and the lotion completes the experience of skin rejuvenation and renewal. Packaged in a charming little suitcase with Fall colors. Item code 02703001 under Aromatic Gifts in the shopping cart. Sea Spa in a Tin This therapeutic bath contains harvested organic seaweed Fucus serratus, dead sea salt and Epsom salt and recreates the traditional combination used in seaweed baths for hundreds of years in Ireland. We’ve updated the experience by including our Sea Spa essential oil synergy of French lavender and seaweed, making this a most powerful detoxifying and rejuvenating spa experience. Very special for the stressed out, overworked person in your life. They’ll appreciate you all year to come. Comes packaged in a nice silver tin with angels dancing all around. Code 02526001 in the Aromatic Gift Section of the shopping cart.